Our South African blogger in Brazil learns the value of being able to speak to people in their own language. These words of our former president have been on my mind for the past few months. I grew up with Afrikaans and English, and like many other South Africans I took it for granted that everyone speaks English. If I went to the trouble, the rest could also do so. That was until I met Brazilians. During my internship at the health magazine SAÚDE in Brazil a few people could speak English but every now and then I found myself in the midst of a lightning-speed Portuguese discussion over lunch or in a meeting. One of the designers on the team, Fernanda, couldn’t speak any English. Fernanda is a short, funny 20-something and she went to a lot of trouble with me. She spoke slowly, tried to explain words and asked people to translate. But with a joke you just have to understand the language. Fernanda is the joker on the team. I had to come to terms with the fact that sometimes I would understand but on other days, when the team laughed heartily, I would have to listen without understanding or participating. Dinner with magazine colleagues. Fernanda is second on the left. 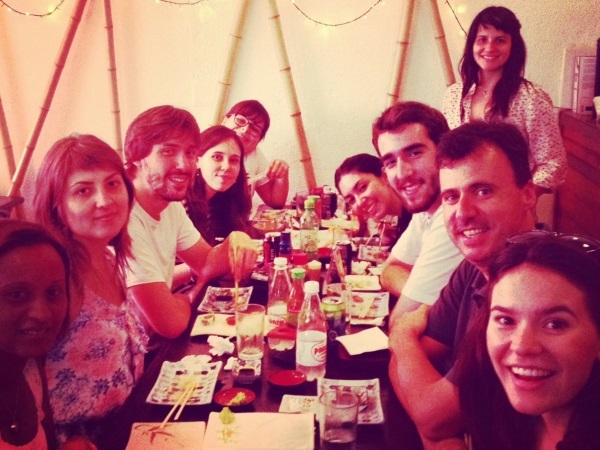 After six months at SAÚDE I’d completed my internship and said goodbye to the team (in English). It was a disappointment; I’d thought after six months I would understand more Portuguese than I did. But apart from the basic words such as “hello” and “thank you” I couldn’t speak the language. Then I met my Portuguese teacher, Karina. For 16 hours a week for nine weeks I wrote down words, did exercises, listened to videos and tried to string sentences together. Sometimes Karina laughed, like the time I confused the traditional dish escondidinho with the word seconder, which means “to hide”. Or like the time I confused sentar (to sit) with sentir (to feel) and said to someone in need, “Me sento muito” (I sit a lot), instead of “Me sinto muito” (I feel sorry for you). But Karina, a slim, petite woman gave her class a big gift: she always believed we would understand. “Muito bem!” (Very good!) she said every time we completed an exercise. She invited us to Afro-Brazilian dance classes, cookery classes and meals at Brazilian homes. The other day I sent Fernanda an e-mail. “Come have a beer with us,” Fernanda replied, as friendly as ever. My husband, Thomas, and I turned up at exactly the right time: an hour-and-a-half after the specified time, because that’s what Brazilians mean when they give you a time. We poured from the communal beer bottle and I broke out in a stressed sweat because I still felt like the girl who didn’t understand. More people arrived and I sat beside Fernanda with her big smile. We started talking: about her upcoming holiday in America, about things happening at the magazine, about Laura (also a designer) who got married and about the time Fernanda had her appendix removed. Later we laughed about the weirdest stuff, like when you have a twitching muscle you have no control over. When I didn’t know a word I asked (in Portuguese) how to say it. Fernanda would tell me and the conversation would continue. From left: Fernanda Didini, me, Talita Marchado and Vanessa Kinoshita. I worked with them at SAúDE magazine. Thomas had brought a South African colleague, Steve, with him. He’d been in Brazil for only three weeks. He leaned across Thomas and asked me, “What are you talking about?” I was surprised when I looked up because I couldn’t explain the joke to him. It was one of those “you should have been there” jokes. Or rather “you have to be able to speak the language” jokes. That’s when I realised I had spoken quite a bit to Fernanda, to all these people but for the first time tonight I’d spoken to them in their own language. It’s a pity I had to come all the way to Brazil to learn the lesson Madiba had tried to teach us. But one thing is certain: as soon as I’m back in South Africa I will start reading a Xhosa book. There are still far too many people in South Africa I haven’t talked to. * Dalena previously worked for YOU. In 2012, her husband, Thomas, moved to Brazil.